How about The Devil’s Cub – Heyer is terrifically droll! But we’ll enjoy whatever you pick! I love Heyer, but The Devil’s Cub has never been one of my favorites. Maybe that’s a good reason to write about it, though. I think Biggles is very UK-specific in the same way Alger is US-specific–I was introduced to him by English friends when I was in high school. Did you read These Old Shades? Because I found reading that one first made me more receptive to Devil’s Cub. I don’t usually like the brooding brat but Heyer pulls it off better than others. I’ve read These Old Shades and i think part of the problem is that Vidal is so much less engaging than his parents. I liked Mary, but was never really convinced he was good enough for her. What books are hiding behind The Young Fur Traders? Oh, good catch. I uploaded the wrong picture–just replaced it. I find the title Young Step Mother intriguing. It’s a Macmillan publication, too. That’s a Charlotte M. Yonge book, and…apparently not one of her best? Some interesting info here. I too am intrigued. Given that it dates from a time when people, particularly women, tended to marry much earlier, I must know: Just how young? yep, that, and what Exactly is the book about? I really like The Young Stepmother, but I have a deep affection/high tolerance for Charlotte M. Yonge. Part of it is the stepmother’s name–Albinia. For me, it’s probably only second to The Clever Woman of the Family. I’m always meaning to read Yonge but I never manage to, somehow. I read a synopsis of The Young Stepmother and I think it was a mistake, because it sounds like it’s full of things I like, but ends badly? Albinia is indeed a great name, though. Yeah, a bit fuzzy there kiddo… I could be a bit snide and suggest you should read the instruction manual for your camera but this blog is emoji deficient and you might get the wrong idea. Besides, we all know that nothing comes with instructions anymore . Sadly. I will study these photos carefully, under magnification. And why does spell check think that “emoji” is mis-spelled? 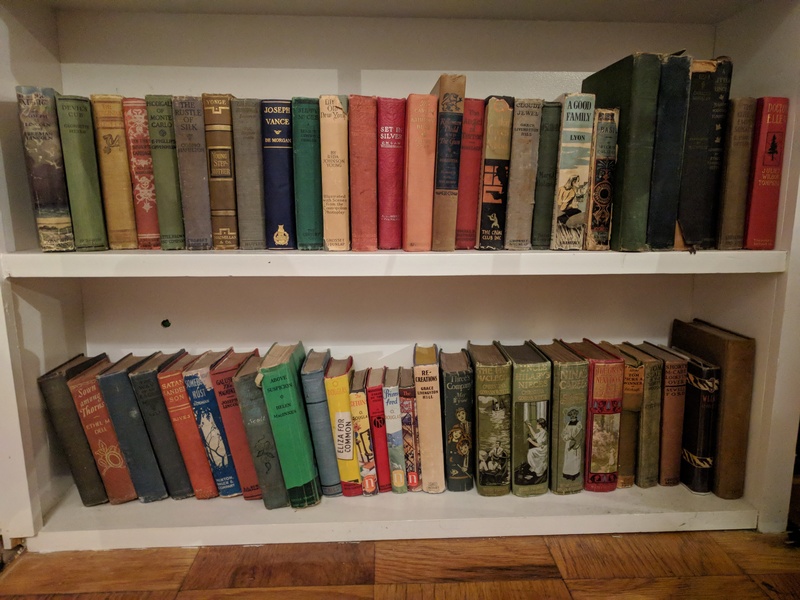 Btw, I think this is a great idea and I LOVE seeing your bookshelves. Mine are much messier. someday i’m going to spend a winter organizing them. You can’t read Galusha the magnificient. i’m thinking of reading it soon and don’t want to know how it ends. Is horatio alger good to read?I’m afraid they might all be too much alike, one to the other…and too moralizing? Yeah, I was doing my best with my phone camera, but its capabilities are limited. I can only apologize–and offer closeups of stuff, if you want them? I’ve already written briefly about Galusha the Magnificent–and I don’t think I gave away anything you wouldn’t get from a blurb on the back of a book. I’m pretty sure I picked up More About P.J. in a used bookstore in London about ten years ago. I remember enjoying it but it didn’t leave a huge impression on me. Looks like the first book is on the Internet Archive. I actually don’t know anything about Lord Frederick Hamilton. Why is he so exciting? Well, I didn’t know him personally ;) but I have read most of his memoirs. They are well written and honest and thankfully void of the vapid political correctness of modern times.He was in the british diplomatic service and went everywhere that was worth going and (a few places that weren’t). If you like to see the world as it was, at ground level, you might like the memoirs. they are not stuffy. he doesn’t talk about sipping tea with one finger raised. he lives through adventures,, befriending the czar in the years leading up to the revolutions, assassinations, big game hunting with indian rajahs, cocaine infused lay-abouts in the jungles of Paraguay and all sorts of things that just couldn’t happen now. It’s very interesting and …what can i say? transporting? I was able to think that i was there in these places. Ofcourse, i like OLD travel writing. And Hamilton’s adventures occur naturally as a part of his work and daily life. they aren’t the artificially sought “thrills” and freak shows of modern travell writing.that’s very impportant. It’s the real world and a genuine life. Hey, I’m really not here for any privileging of format over content. As far as I’m concerned, making books more accessible is always a good thing. I own a lot of physical books. I read a lot of books online. I don’t like that you’re making moral judgments — good or bad — about either of those things. Have you read the Betty Gordon series? I liked it better than Ruth Fielding & the first one is on project gutenberg if you don’t have it. I also liked Marjorie Dean series – which may be on your shelf. I’ve read Betty Gordon in Washington, but it was a long time ago, and I think I didn’t like it as much as Ruth Fielding. I have the first Marjorie Dean book–it’s in the second picture, top shelf, between the Dana Girls and L.T. Meade. I’m pretty sure I’ve read it, but a lot of college girl books run together for me. To me, Ruth whines. Marjorie Dean starts in HS but of course it’s the college ones which were more fun. Hmm. I’ve never found Ruth whiny, but I also haven’t read enough Betty to be able to compare them. So, I think the Marjorie Dean book I have is a high school one and I haven’t read it. The more I think about it, the more sure I am that I read at least a couple of the college ones when I was in college. Crowd-sourcing reading decisions – good idea. I suggest: The Mysterious Half Cat; The Red Cross Girls in the British Trenches; In the Bishop’s Carriage; or Satan Sanderson, all of which sound intriguing. I actually reviewed In the Bishop’s Carriage at Edwardian Promenade back in 2010. I love it a lot. The Mysterious Half Cat is a Judy Bolton book. I bought Satan Sanderson at a used bookstore in Italy and have never read it. I think I read The Red Cross Girls in the Trenches the first time I had jury duty. I’ll put them all down on the suggestion list. Thanks! Thank you for the link – I enjoyed the review. The Motion Picture Chums at Seaside Park sounds like good, clean fun. It does, doesn’t it? I don’t think I’ve ever read that one, actually. Doctor Ellen! I just looked at the first few pages on Hathi. You’re in luck, because I’ve already written about that one. Not one of my favorite Tompkinses, but I liked it much better on the second read. I’m reading “Betty Gordon in Washington.” “BG in Bramble Farm” is the first one, but I prefer not to deal with the farm’s proprietor. 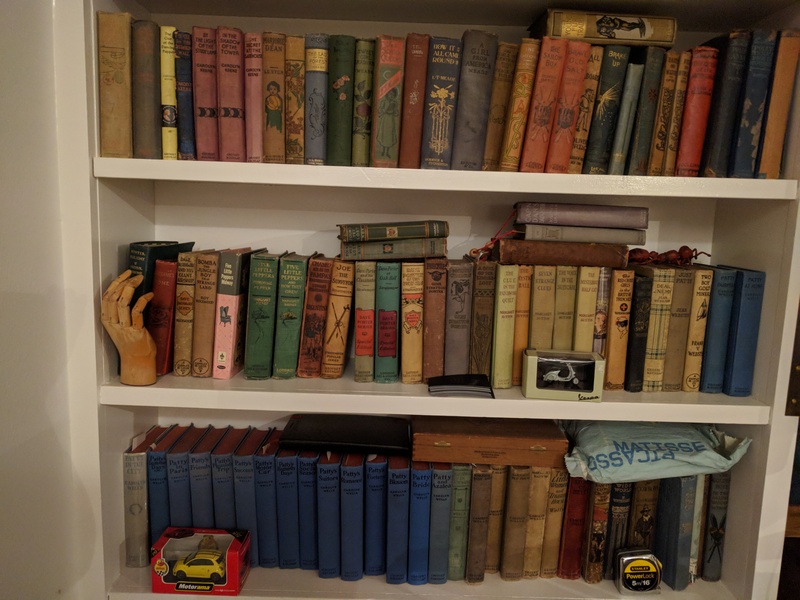 For those of us not owning that bookshelf, I’ll point out that lots of those books are available on Gutenberg. It’s where I find most of my reading these days. That’s…kind of the entire point of this blog? If I post about a book without linking to an ebook on PG, or Gutenberg Australia or Canada, or Google Books, or the Internet Archive, or HathiTrust, it’s because I haven’t been able to find one. The Devil’s Cub, because I think it’s great. I wrote about Little Old New York here and Cormorant Crag here. I should reread The Rebellion at the Academy. I read it when I was in high school and all I really remember is that there was a river and someone got locked in a closet. Tom Picks a Winner is part of the Tom Slade series, by Percy Keese Fitzhugh. The Girls Next Door is by Christina Gowans Whyte, and I haven’t read it yet. Sown Among Thorns, like The Way of an Eagle, is by Ethel M. Dell. I don’t have any suggestions, except to say that I want to move in with you for several months and just work my way through those bookshelves! Also, I’m so glad you’re back online–I’ve been so worried about you! Also, have you read “Tempest and Sunshine” by Mary J. Holmes? My son got it for me for Christmas, and I’m finding it really slow going. I wish there was a feasible way for me to lend out books. I haven’t read Tempest and Sunshine–is it one of the too black-and-white ones? Sometimes I think that Holmes only wrote nuance by accident, and just had…a lot of accidents. Thanks for worrying about me. I had a rough second half of the year, mental health-wise, but I hope I’m digging myself out a bit now. Tempest and Sunshine has two sisters, one of whom is soooo good and the other is evil. Plus it’s just very long and drawn out and I don’t actually CARE about any of the people. I switched to reading “Meg of Mystery Mountain” by Grace May North and liking it MUCH better. 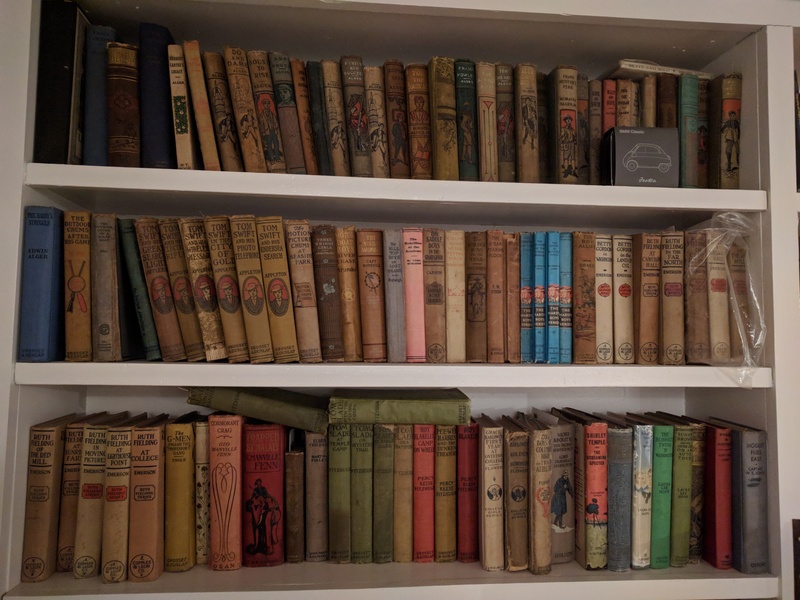 For what it’s worth, I found your photos easy to read, given the number of books you tried to show. Not all titles are readable, but that’s to be expected. Thanks for posting. Thanks! I knew it wasn’t going to be perfect, but I did my best. I’ve written about a bunch of them, but there’s also a fair number I haven’t even read. I find myself reading etexts even when I have a physical copy of the book pretty often, but I’ll try to include more pictures of the books I’ve got.